Für einen etwas anderen Architekturwettbewerb werden zurzeit Vorschläge gesucht. Geplant wird die Hauptstadt des Mondes. Wer Zeit und Lust ohne Vorgaben und Nachbarn zu planen, informiert sich auf http://www.shiftboston.org. For the future of design start looking to space. 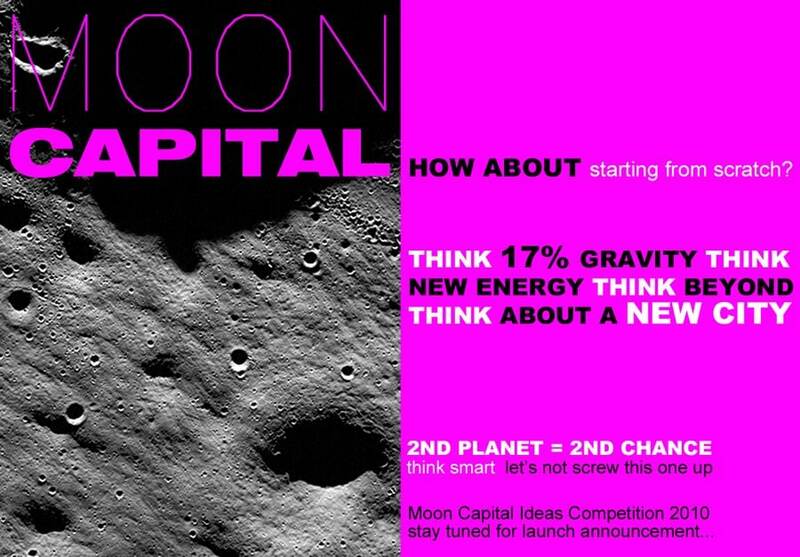 SHIFTboston is calling on architects, space-architects, scientists, engineers, urban designers, landscape designers, industrial designers, fashion designers, artists and futurists to submit their most provocative ideas for the moon. We seek to collect visions that will provoke thought on the moon as a new DESTINATION. We want radical ideas for new lunar elements such as rovers, growing pods, inflatable structures, droids and lunar HABITATS. How about a new moon culture? Envision: FUN on the moon – activities, moon fashion, and spacesuits! YOU TELL US. Members of our stellar jury include: Space Architect and National Geographic Emerging Explorer Constance Adams, Architect and Partner at UN Studio Astrid Piber, NASA Habitation Systems Architect Kriss Kennedy and Architect Amanda Levete. The honorary recipient will receive a cash prize and present at the MOON CAPITAL Forum at the Cyclorama in Boston, Massachusetts on Thursday, October 21, 2010. The forum will be a panoramic gala event, including members of the MOON CAPITAL Competition jury and advisory panel, astronauts, aerospace and astrophysics engineers, government, community, industry and academic leaders along with artists, architects, and design professionals.